Just after Pandora came out of beta, I created a station seeded from Damien Rice, and one of the songs that kept popping up was “Jen is Bringin the Drugs” by Margot and the Nuclear So and So’s. It’s Richard Edwards — singer, rhythm guitarist, and chief songwriter for Margot — by himself, a sad song with just an acoustic guitar and vocal, and it has an aching, world-weary beauty that stuck with me. So when I went to MySpace Music to check out the band, I was surprised to discover that Margot and the Nuclear So and So’s actually has a roster that rivals its unwieldy moniker. The band has something like nine people in it, and most of the tracks on The Dust of Retreat feature layered guitars, bass, piano/keys, horns, strings, drums, and percussion. A bigger surprise came when I saw them live, and Margot instantly became maybe the heaviest band I have ever seen — and I’ve seen Cryptopsy, Metallica, the Dillinger Escape Plan, Napalm Death, you name it. In the Troubadour in Los Angeles, they brought the members of the opening act up onstage with them, at times resulting in 12 people playing together, threatening to buckle the rafters with what I had always thought of as nice little indie pop songs. 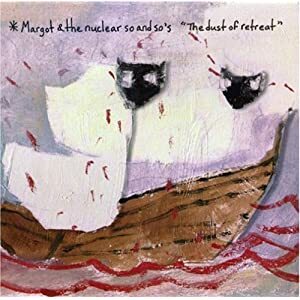 That just goes to show that there is nothing else out there like Margot and the Nuclear So and So’s, and their debut album, The Dust of Retreat, is a unique work that insists on being listened to over and over again. There is a breadth of diversity on Dust, but it still manages to remain cohesive. “Quiet as a Mouse,” for instance, begins as an atmospheric mystery conjuring images of alienation, and explodes into a clinic of wall-of-sound rock. “Talking in Code” tips delicately between a soft acoustic guitar and what sounds like an entire marching band, all anchored by Edwards’ tender, melancholy vocals. Margot has been compared to Arcade Fire, which isn’t quite right, and I hear echoes of Death Cab for Cutie, though more raw and earthbound, and the later Beatles albums, with the notable exception that those albums were culled together from four distinct voices, and Margot’s work reflects the strong, if diverse, guiding hand of a single architect. After The Dust of Retreat, Epic Records signed the band, and the immediate result was a very public dispute over the content of the band’s major label debut. Epic released an album called Not Animal, and permitted the band to release their own preferred version, Animal!, on vinyl and (eventually) digital. Both are wonderful albums (but FYI, the preferred version of “Broadripple is Burning,” woefully over-produced on Not Animal, can be found here, as performed at Daytrotter Studios), but they seem less urgent than Dust, so it remains at the top of my Margot playlist. Potential barriers for the uninitiated: One of the strengths of this album is its musical diversity, but lyrically the songs are uniformly pretty somber. This album feels like it was written while trapped inside during an Indianapolis winter (and it probably was…), and while there are moments of real humor that poke through — “Paper Kitten Nightmare” stands out — people who aren’t so into the mopey side of indie rock might have a couple of hang-ups with the record. Nirvana and Pearl Jam, 20 years on. On August 27, 1991, Pearl Jam released “Ten,” their first album. A month later, on September 24, 1991, Nirvana released their second album, “Nevermind,” so for the last month there has been a ton of media coverage about the 20th anniversary of each of these landmark records. I don’t need to say anything about how transformative they were — that’s what the media coverage and the “Alternative” section in the few remaining record stores are for. What strikes me most about these anniversaries is the vast, heartbreaking chasm between how each is being celebrated. “Ten” came out first, but didn’t find success until the entire Seattle scene was borne up on the wings of “Nevermind.” I can’t remember which album I got first, but I got each within just a few weeks of their release, and have loads of memories about each band, each album, and that particular time of being a music fan. It was invigorating, and I admittedly owe much of my life to those two albums, since as a 13-year-old kid who had just gotten his first drum set, they inspired me to play music. “In Bloom” was one of the first songs I ever figured out how to play on the kit. Here I am 20 years later and still churning out music of my own. Pearl Jam turned 20 and celebrated with a big book, a bunch of live and unreleased recordings being issued, and a retrospective documentary by Academy Award-winning filmmaker Cameron Crowe. I’ll go see that this weekend. For the “Nevermind” anniversary, Dave Grohl and Krist Novoselic have done a couple of interviews with Butch Vig, the album’s producer, standing in the big hole left by Kurt Cobain’s absence. Listening to an interview with Vig this morning, it just made me incredibly sad. I know how the story will end three years later, and all of these articles and stories about “Nevermind” don’t feel to me so much like a celebration, but a requiem for a guy who desperately wanted the one thing in the world that was sure to destroy him. Even in his time, Kurt Cobain was assigned iconic status, and when you look at an icon it’s hard to recognize the human stuff going on with them, and I can’t fathom how awful it must have been to achieve everything you’d dreamed of and worked for and find out that it left you empty. This guy going through this stuff, though, with a such a muddy view of his own life, gave people like me a vision of their own, saving lives, shaping them, and giving people hope where he felt none. I can’t do the cosmic math to figure out how this all balances on the books, but more than anything, this week of looking back has made me glad that I have the albums and the memories, and sad that they cost so much.